Hi all. Having just moved to our new home I'm embarking on decorating everywhere. There are a lot of inherited features which I just can't afford to change. 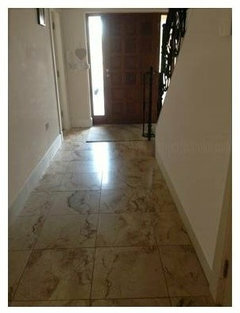 As you can see from pics there are marble tiles on floor and black iron staircase these have to remain. The table is outta here. I intend to replace the table with perhaps a bronzed metal and glass table. I also intend to add a photo wall on the curved wall ( before it curves ! ). My dilemma is the paint colour. Anyone got any suggestions? I want to darken the walls but remain neutral. The hall is North facing and only gets light from two side windows. Any help would be much appreciated. From this one photo, I would not go dark with your paint color. A brighter color can also be neutral such as green. Paint the front door white and green or another bright color for the walls. Add a runner to soften the marble, especially if you want to add more metal and glass table. Hi, you asked on my thread earlier today about my hallway colour. I live in Ireland and the paint is by an Irish company. We were aiming for a neutral colour as close as possible to the much loved Revere Pewter by Benjamin Moore, which sadly isn't available here. We also had to choose a colour to complement our oak overload, a problem you don't have. Don't know that we managed it but we love our colour nonetheless. I am going to suggest the opposite, I would go dark on the walls and if they are in perfect condition I would use a satin finish. I think you idea of a bronze or gold accent piece would be great. I particularly love the chest in this picture because the frame is black like your black iron. Yeah JudyG I love this chest. Yeah, I think I want to try and embrace the darker walls. I thought rather than try to brighten up the dark room perhaps embrace it and create a more interesting space. Don't think I'm brave enough to go as dark as the paint in the picture you sent but I thought perhaps something with an umber tone. What dya think? I'd love taupe. Any colour shades you'd suggest? I tried a taupe but the pink undertone was really fighting with the tile. It was a particularly dark shade though and on the wall it looked pretty heavily loaded with pink/lilac. I'll send on a photo. I love dark walls and I think your hall with the shiny floors and the right finish on the wall make it special. You already have the wrought iron, which definitely dictates a certain look. I hesitate to recommend a specific color from my monitor, but look at the BM colors in the 1037’s through the 1078’s and see if there is something there which looks good with the tile. I'm not necessarily good with colour but saw this photo and thought of you. With a dark runner? Or maybe a darker colour is safer with that tile. Looking at the photo and the tiles color I would suggest you can go for a shade of brownish Beige. If you have Sherwin Wiliams store around you go for SW 6108 Latte. It will compliment your space and you can have a gold and bronze frame wall decor. Hi! One of the things I look at in designing is the "feel" I want in the room. 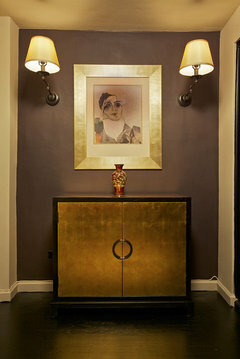 If you like a more elegant feeling then darker walls would help. If you can get the paint chip - most store can mix the color you want. Hi siobhand, me too I'm in Ireland, Cork. The colour you sent is exactly the colour I'm looking for. I'm wondering if Johnstones wouldn't up the Benjamin Moore colour, or did you already try that option? Thanks so much for the help and sorry again for hijacking your forum ! Hi DekoRat. Yeah your right a latte shade would work well. I'm in Ireland but thinking maybe I could get a company here to mix that shade? Thanks so much! Hi VirginiaFair. Yeah I agree. 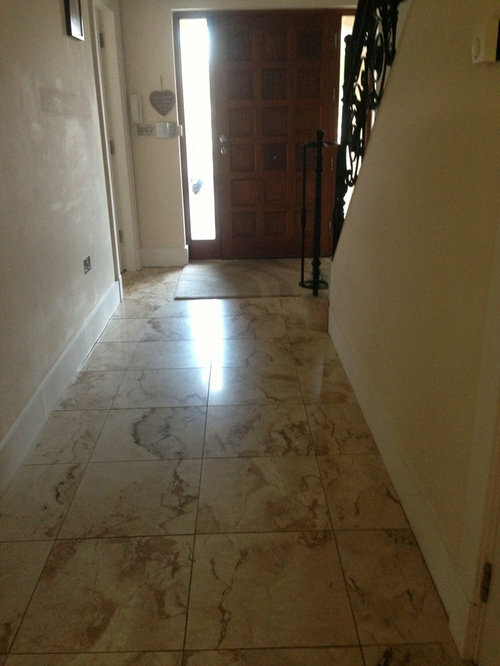 Dud want something a little more elegant than just sticking up a cream shade or a bright colour and hoping that would give the hallway a lift! It's dark, I'm thinking I won't fight that, but use it. I'm going out today for paint chips, I'll keep you guys posted on how it goes. Thanks everyone for your comments. So helpful!